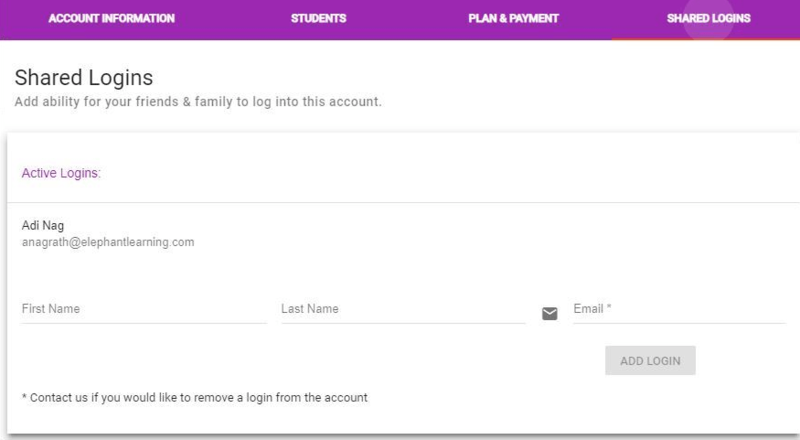 The Shared Logins screen allows you to create logins to your account for other family members. This is useful, for example, for grandparents, teachers, tutors, babysitters, and etc., so that children may gain access when they are not near their devices. To create a shared login, enter the user’s first and last name, along with their email address and hit save. An email will be sent with a password to that email address. If you wish to remove access, please contact us via email or via the chat widget on the bottom of the screen. We will remove the shared login that you request to be deleted.